This was our 3rd stay and has become our favorite cabin along Lake Superior. It is very clean and well-maintained and cared for. The property is large with privacy and room to walk around and let dogs run and play. Located near Lutsen proper, Cascade State Park, and only 8 miles form Grand Marais, everything is convenient and easy to get to. We love this cabin and where its located, its close enought to the ski hill but far enough for a quiet and peaceful stay. The lake is so beautiful and the cabin is so cozy and clean... we were certainly very dissapointed in the sauna not being accessible. We hopefully will come back sometime soon. We loved all of it..it was awesome!!! One of the nicer places we have stayed through Cascade rentals. Location excellent and the amenities were suberb. No dislikes and enjoyed everything. Being to have our dogs with us to enjoy also was a big plus. the cottage was super cozy, warm, and very, very clean. we were able to settle right in and unwind. we felt almost like we were in a boat with the close proximity to the lake. the small peninsula in front of the cottage was a great little surprise- it was an amazing spot to feel the wind and look at the stars. We had a wonderful time! Drom Hytte is in an amazing location. 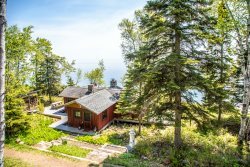 Everything you need for a stay on Lake Superior is provided and the home is absolutely clean. We will stay again! We stayed at Drom Hytte. The cabin is so close to the water and the sauna is wonderful. The home is well cared for and you feel at home right away. We love this place! Drom Hytte was a fantastic place to stay. Nice size. Totally clean. Gorgeously positioned. Fantastic views. Beautifully appointed. Plenty of dishes and cookware - all lovely. LOVE the stove. Peace. Quiet. Privacy. We would stay there again in a heartbeat. We've stayed in many places on the North Shore. This was the best. It was very comfortable, clean and simply organized. The location was perfect sitting right on the rocky shore so we could enjoy the waves and view up and down the shore, plus the vista. We loved being able to relax, due to the privacy, seclusion and cozy living room, bedrooms, kitchen, plus All needs were met and all arrangements were made in advance.